Numerology scientifically and metaphysically interprets the energetic weight of numbers, and the impact their frequency has on us. When a number repeats itself, it delivers an intensified and powerful meaning from Higher Source. Angel Number 777 has significant vibrational energy, especially when it appears in your life. Angel Number 777 contains a couple of different numerical elements in its energetic vibration, each with their own internal frequency that creates the final meaning that Angel Number 777 emits. To fully understand its meaning, we need to analyze the energy of the numerical components within: the Number 7 and the Number 3. In Numerology, the Number 7 reflects the holiest and most magically intuitive of all of the cardinal numbers. The 7 possesses a fascinating set of characteristics; it is an energy of analysis and logic combined with knowledge-seeking and attaining an understanding of spiritual and mystic and occult-related truth. In the physical world, the Number 7 emits a frequency that is full of many powerful vibrations, including: heightened awareness, understanding, organization, judgment, and intuitive cognition. Going within, (into conscious introspection) and elaborate processes of thought are expressed in the 7 – with an especially strong energy that reflects the capability to contemplate and uncover truth in any situation. Some of its more spirituality-related qualities include: a need for unseen wisdom, ancient knowledge, ancestral rituals, alchemy, connecting with the collective consciousness, extraordinary psychic abilities, searching within, occult studies, meditation, and spiritual awakening. The visual shape of the 7 displays the meaning of its energy. The simple straight lines reflect the logical and rational thought processes emitted. And the foundation of its shape is based at the top (as opposed to the bottom), representing its skill of analysis and contemplative nature within the mind. Another interesting aspect of the shape of the 7 is that the base of the 7 at the top also represents its esoteric nature – a base of spirituality holding infinite wisdom. Number 7 is grounded by remaining mainly in its “head,” while the simplicity of the shape expresses how easy life energy can become by possessing a balance between both logic and spirituality. The 7 also reflects Kundalini energy, and the flow of this life force through the 7 chakras. In addition, it is helpful to know that the 7th sign of the zodiac is the cardinal air sign Libra, and the 7th card of the Tarot deck is The Chariot card. 21 reduces to 2+1, which = 3. Of all of the single digit numbers, the Number 3 is one of the numbers most referenced in spirituality and scientific law. In our Universe, 3 only becomes an official law when something dominant is combined with a force that neutralizes it. This is because 3 creates a unit. Neither of the original two are larger or more significant than the other after that. Each portion of that unit will then behave not only for itself, but also for the benefit of the whole. The visual shape of the 3 represents the vibrational energy it carries. The number 3 is balanced, with no part of it being “heavier” or more dominant than another. The Pythagoreans said that the 3 should be considered the first “true” number, as it is also the first single digit cardinal number to reflect a geometrical figure (the triangle). Some other aspects related to the Number 3 include the 3rd sign of the zodiac, Gemini, and the 3rd card in the Tarot deck, The Empress card. Angel Number 777 contains a combined vibrational energy of the Number 7 and the Number 3. But remember, a repeating triple-digit number sequence intensifies the energy of that number; in this case – the 7. When Angel Number 777 reveals itself to you, it is relaying a motivational message from your Higher Self and the divine energies that you are on the right path toward spiritual enlightenment and awakening. The 7 reflects the “logical intuitive” here in the physical, while the 3 reflects the utmost in optimism, self-expression, and creativity. 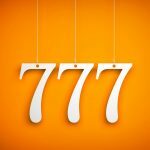 If you are constantly seeing Angel Number 777 , it is an intensified 7. This means that you are extremely close to the spiritual realm, and your intuition is correct and paying off. By keeping this in mind, and knowing that the Universe is on your side, you can take advantage of achieving your goals by being confident in your creative self-expression. This is one of the highest vibrations of spirituality within a triple sequence number, so the angels and higher divine guidance are close by supporting your every positively-vibrating action. When you see this number, especially repetitively, you are on the right track to manifesting your dreams because you have been following the synchronistic and subliminal guidance given to you. Stay focused, mindfully aware, and positive, and you will successfully ascend toward your soul’s mission and higher life purpose!